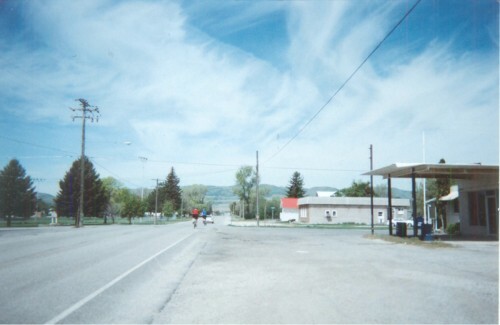 Under a dynamic sky, two riders enter the city of Newton along State Route 23. Photo by Wayne Cottrell. The Cache Caribou Classic is a great, summer ride that starts in northern Utah, crosses into southern Idaho, and then returns to Utah. 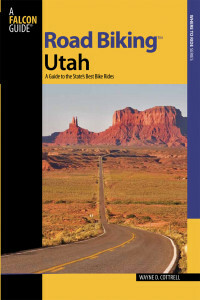 The route visits Cache and Box Elder Counties in Utah, and Franklin and Oneida Counties in Idaho. It is an 88.1-mile loop. The elevation ranges from 4,250 feet at State Route (SR) 30’s crossing of the Bear River, just east of Riverside in Box Elder County, to 5,569 feet adjacent Weston Reservoir, near Weston Canyon in Idaho. Start the ride at Riverside Community Park in Riverside (Utah), located on 15400 North just west of State Route (SR) 13 in Riverside. To get to the park, take the I-15 freeway north to the SR 30 (15200 North) exit (north of Tremonton). Turn right onto SR 30 and head east. At SR 13, turn left and head north. Turn right onto 15400 North and head east. The park will be on the right. Riverside is an unincorporated community of about 760 persons (2010 Census), located in northern Box Elder County. Head west from the park on 15400 North; turn right on SR 13 and head north. Your starting elevation is 4,368 feet. SR 13 is a lightly-traveled highway, carrying just 985 vehicles per day in 2012. Continue heading north through Plymouth. Although most of Box Elder County is barren desert, on the north side of the Great Salt Lake Desert, this region of the county, the Malad Valley, is quite fertile. Crops such as alfalfa, barley, corn, oats and wheat are grown here in abundance out here. Plymouth is a small town, having a population of just 414 as of 2010. SR 13 turns left onto 20800 North, north of Plymouth. At I-15, 7.5 miles into the ride, turn right onto the northbound on-ramp and, riding on the shoulder, head north. Ride on the freeway? Yes – there are no other through, paved routes in this region, so the next six miles of the ride have you hugging the freeway shoulder. The freeway was carrying 9,095 vehicles per day along this segment in 2012, however, making this the most lightly-traveled segment of I-15 in the entire State! Take the next exit, at 25800 North; turn left at the end of the exit ramp. Once beyond I-15, turn right onto the I-15 frontage road, and head north. You are now riding parallel to I-15. 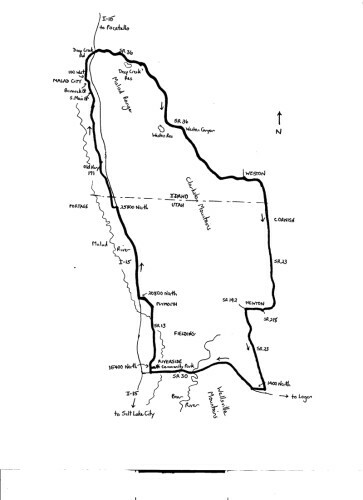 The road is also referred to as Old Highway 191, which was the main north-south route before I-15 was constructed. To the west of here is one of Utah’s mostly northerly towns, Portage. Head north across the Idaho border, at mile 15.5 – no passport required. You are now in Oneida County! The Malad River flows to about one-half mile to your left. On your right, just on the other side of I-15, is Caribou National Forest, which is part of the 2.6-million acre Caribou-Targhee National Forest. This component of the forest features sagebrush and grass. Continue along Old Highway 191 as it gently curves northward through the Malad Valley. Upon reaching the southern limit of Malad City, at mile 27.6, the road becomes South Main Street. Malad City, with a population of 2,095, is the largest city along the entire ride. Malad means “sickly,” in an errant reference to the area’s drinking water. The water is fine; 19th century mountain men took ill here after eating some beaver! In 1975, a 6.1-magnitude earthquake damaged about two-thirds of Malad City’s buildings. Also, somewhat in keeping with the city’s name, a 2003 influenza outbreak, which was nationwide, hit the city particularly hard. United Presbyterian Church, on South Main, is listed on the National Register of Historic Places. Near the center of town, South Main curves to the left, becoming Bannock Street. The set of buildings at the corner of Main and Bannock, representing the Co-op Block and the old J.N. Ireland Bank, are all on the National Register. After two blocks, bear right onto 100 West to continue heading north. After a pleasant ride through the heart of Malad City, and its comparative hustle and bustle, leave town; the road becomes Deep Creek Road. As Deep Creek nears I-15, the road curves sharply to the right. After crossing over I-15, at mile 32.5, you are on SR 36 (still on Deep Creek). Deep Creek Reservoir is on the right as SR 36 climbs into the northern reaches of Malad Range. Enter Caribou National Forest around mile 40, although, as noted above, there is little forestation out here. By this point, the highway is heading south. Weston Creek Reservoir is on the right at mile 44, near the highest point of the ride (5.569 feet). Enter Franklin County as SR 36 heads into Weston Canyon (now on Weston Canyon Road). Mountains in Malad Range ascend to over 6,500 feet on either side of the highway, amid some interesting canyon formations. An ancient rock shelter in the canyon was used by the Great Plains Culture, thousands of years ago. Exit the canyon after a brisk descent, and enter the fertile Bear River Valley. The Bear River is notable for being the longest river in North America (nearly 500 miles) that does not reach the ocean. The highway continues to descend. SR 36 bends eastward, becoming 1st North as you enter Weston, 54 miles into the ride. This small city had a population of 437 in 2010. Turn right onto Westside Highway – the highway curves sharply to the left, becoming Depot Street. Depot takes you directly through the center of town; the road continues to descend. Upon leaving Weston, now at an elevation of 4,622 feet, Depot Street curves to the right, once again becoming Westside Highway. You are now heading south. Cross the Utah border at mile 57.3; you are now in Cache County, along SR 23. Enter the city of Cornish (population 288 in 2010; elevation 4,488 feet) as you pedal into Cache Valley. The not-so-little Little Mountain is to your right somewhat south of here. SR 23 climbs gradually as it passes along the western flank of the mountain. At the junction with SR 218, turn right to continue on SR 23. The highway enters Newton (mile 68.8). At 787 residents in 2012, this is one of the larger settlements along the route. Ride through town. At 300 West, on the far western edge of town, turn left to continue heading south on SR 23. The highway crosses Cutler Reservoir – a refreshing scene on a hot day – as well as Cache Junction (small, old railroad settlement). After a pleasant southward jaunt along SR 23 on the west side of Cache Valley – on a route that is popular with local cyclists – turn right at mile 77.4 onto 1400 North. At the road’s end, at SR 30, turn right. This climb is gentler than the one that brought you into Weston Canyon, earlier – but now your legs are tired! The route makes a passage between the Wellsville Mountains, to your left, and the Clarkston Mountains, to your right. The climb, to around 4,990 feet at the border between Cache and Box Elder Counties, is rewarded with an exhilarating descent into Malad Valley along SR 30. Once you have returned to Riverside, turn right onto SR 13 to return to 15400 North, Riverside Community Park, and the end of the ride.